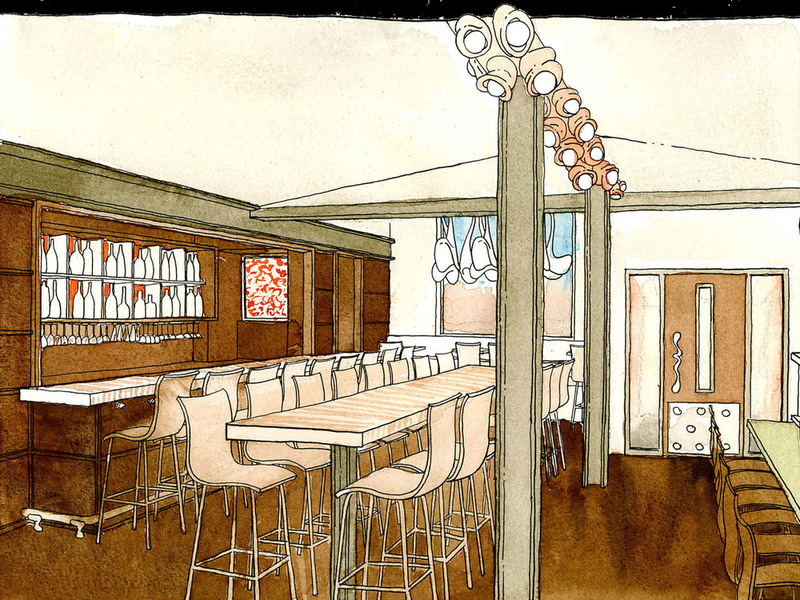 The construction of two new buildings unified two existing structures, enlarging an American-Japanese fusion restaurant for a Korean-born restaurateur in a gentrifying Ukranian Chicago’ neighborhood. Imagery extrapolated from Jacque Cousteau’s 1960’s photos of cephalopods, a variety of which are found on sushi menus…. Chicago’s vibrant Bucktown and Wicker Park neighborhoods meet at West Division Street, a high street with a collage of boutiques, galleries and night-life destinations, including Bob San, a freestyle Japanese-American restaurant, bar and lounge. Bob San’s Korea-born founder apprenticed as a chef in Japan before opening restaurants in Chicago. Bob San, his third venture, originally opened in 2000. In 2009 he purchased a building and vacant land next-door and asked JMA to assist him in reinventing the business and creating a lounge, a private dining room and an expanded bar. 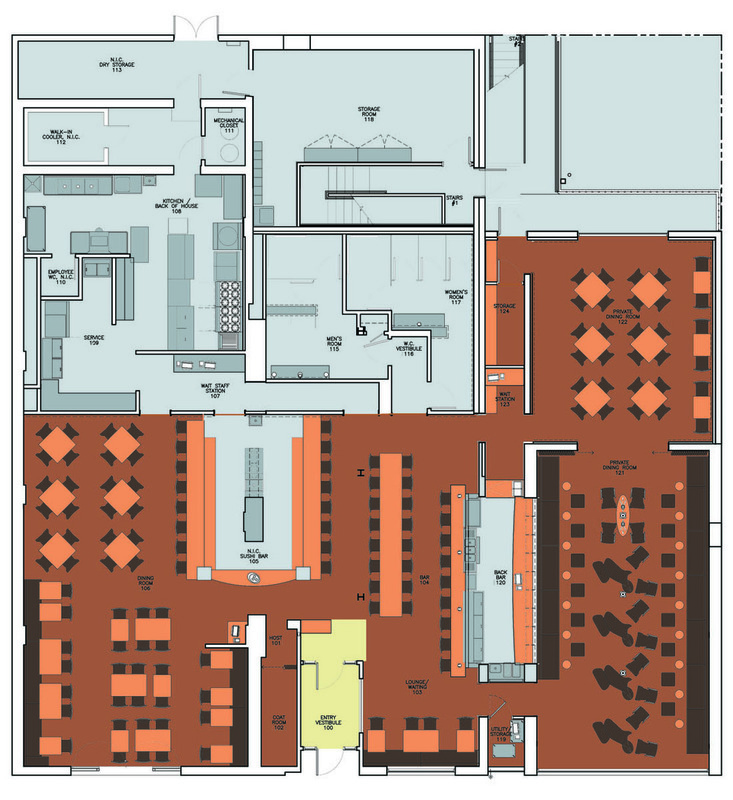 A new circulation system links the renovated Dining Room, the new Bar, the new Lounge and the new Private room, four separate public spaces with individual personalities and moods that may be operated separately or together, as business requires. Existing kitchen, office and dining room areas were extensively rebuilt and refined. The Bar was expanded. The bar itself was relocated, pushed out onto the alley that once separated the two properties and capped with a new roof. The second floor of the three-story building annexed to the existing restaurant building was removed and two floors of the existing interior were gutted to create a dramatic double-height lounge with walls of sandblasted Chicago common brick enhanced with pigment and a new glass façade at the street. A deep steel beam was placed in the back wall of adjacent building to create a wide arch leading to the Private Room, a ground-up building constructed on a patch of vacant land. Featured design elements were inspired by Jacques-Yves Cousteau’s photos of cephalopods (the family of octopus, squid and the chambered nautilus) published some years after he had invented scuba gear. Other images refer to Japan and pop culture. THE CONTEXTBucktown / Wicker Park is young, gentrifying neighborhood ten minutes from Chicago’s central financial district. Bucktown got it’s name from the male goats who lived in the front yards of the homes there one hundred years ago. 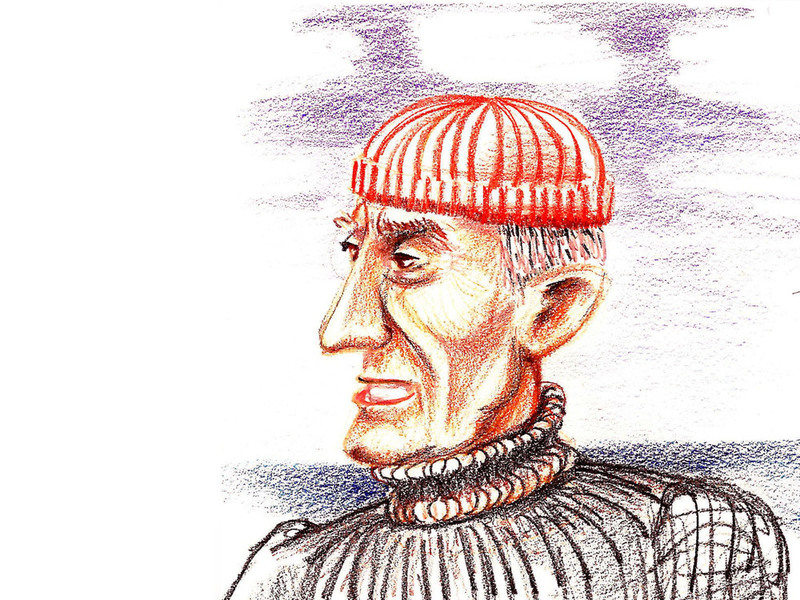 THE GUESTS: Bob San draws local and tourists between the ages of 25 – 45.
and red tones in them. The ceilings are composed of sandblasted exposed wood framing. Raw steel beams. Floors of solid unstained wood. cephalopods on every sushi menu, informed by the 1960’s photographs of Jacques Yves-Cousteau, the inventor of scuba. without conflict between kitchen and guest traffic. A new bar was built on vacant land between the original Bob San Restaurant and the former Leo’s Lunch Room building. Restaurant and has been extensively renovated. Service stations are located at both ends of the bar. New bathrooms are located near the bar. and also suggestive of ikura sushi. OCTOPUS: Jacques Cousteau writes about bio-luminescent cephalopods which glow at night to attract mates. 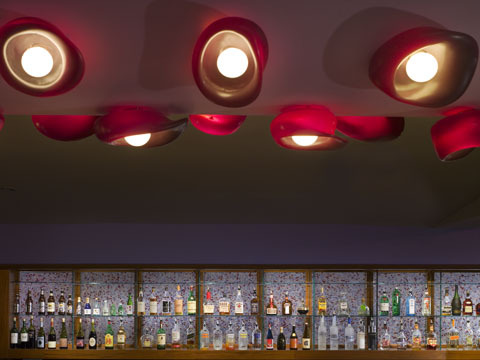 This idea and the image of the red and white octopus arms used to make “tako” sushi inspired the light fixture in the bar. It is composed of steel and sculpted elements that were cast in solid resin. then cast in re-cycled aluminum-magnesium alloy, and then hand polished. than the bar with low seats and less density, more rustic than the private room, more dramatic than the dining room. partition between Leo’s Lounge and the Private Room. The circulation system allows these two rooms to be operated separately. The lighting is subtle, reflected off of the brick walls and pink sculptures on the upper walls of the lounge. to amplify the warm yellow, orange and red earth tones. 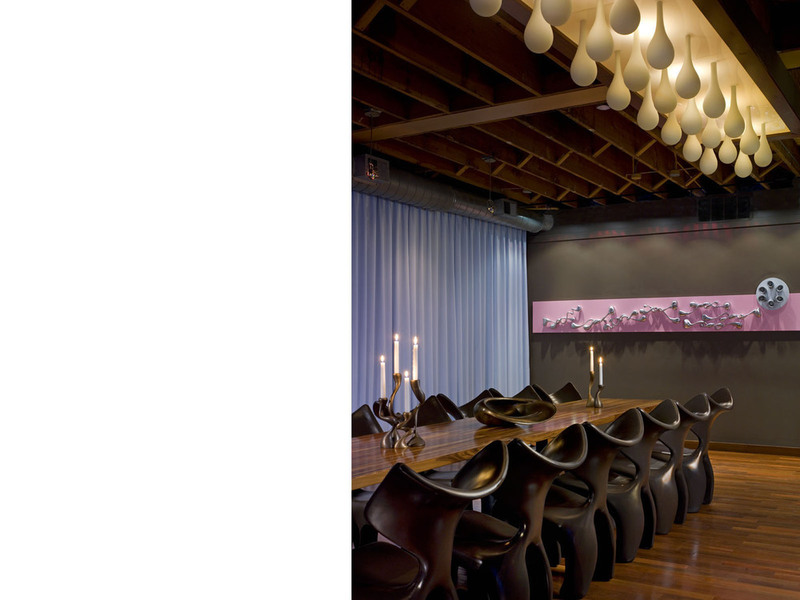 SEATING: Hand-sculpted seating composed of cast resin creates flexible seating in the center of the room. exclusively for Bob San’s Lounge. are lights directed at the sculptures on the upper walls of the lounge, which act as reflectors. The sculptures are composed of lacquered cast resin. Private Room is more colorful and less rustic than the other rooms, to emphasize a sense of discovery and specialness. constructed on vacant land behind Leo’s lunch room. four public spaces was re-worked to increase efficiency and reduce collisions or conflicts between servers and guests. to flatter guests and crate a calmer atmosphere. A powder blue velvet drape was added to soften the acoustics in the dining room. The seating was modified to be more flexible. Durable solid walnut tables replaced veneered tables. Chocolate resin chairs and banquettes replaced old seating. MILK AND HONEY CHANDELIER: Composed of steel, computer milled glass and locally hand blown, sand etched glass. You Enterprises restaurant in Chicago, in 1985.